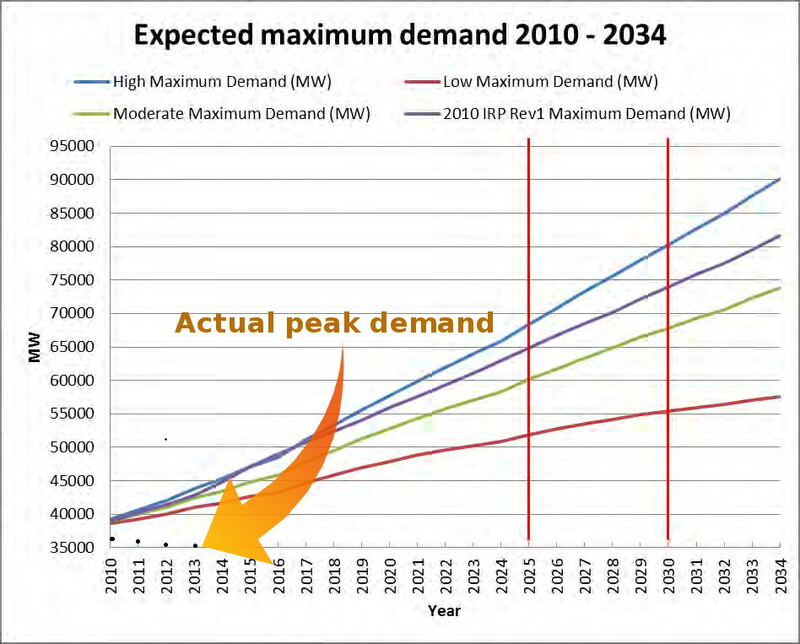 GIBB uses this graph to justify the need for a massive increase in generating capacity by 2030, and hence the need for nuclear power. This is based on the IRP 2010 report, which in turn was based on government predictions of 5% growth per annum in the South African economy. As is common knowledge now, this predicted growth failed to materialise. Now we have actual data, which can be compared to the above. 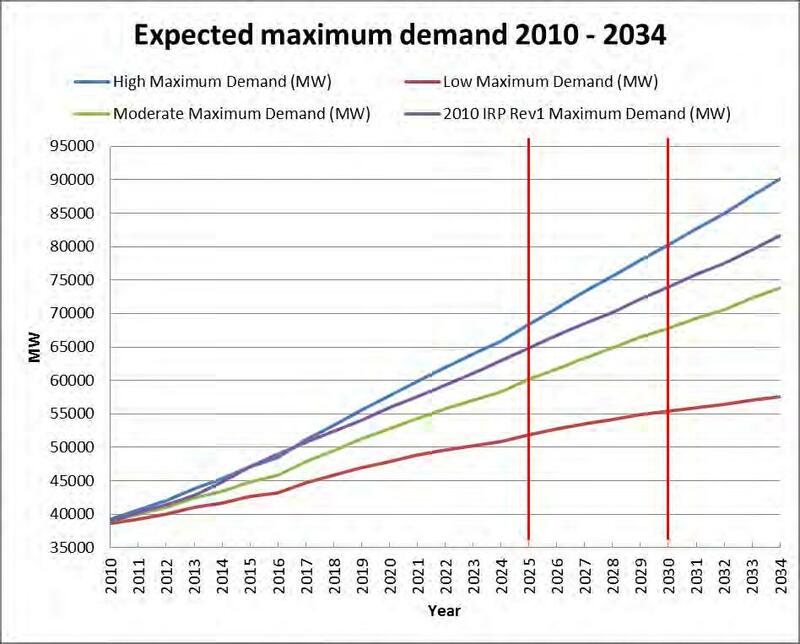 The GIBB consultants wrote in 2015 that in the ‘moderate’ case, demand would grow “from approximately 39GW in 2010 to about 74GW in 2034”. GIBB is badly wrong here, and either they know it and are choosing to conceal this, or they are frighteningly misinformed. If its the former, they may be subject to criminal prosecution and jail sentences. If its the latter, they are simply incompetent. The actual maximum demand in 2013 was 35 984MW. The GIBB consultants have a responsibility to put all pertinent information before the decision makers, and so must incorporate this data into their final report. To knowingly do otherwise would be criminal. Note that this is not the first time the GIBB legal department has been used to threaten KAA. In 2010 GIBB wrote this letter about the video footage used for this post, after the facilitator refused their request to forbid KAA to video the public meeting. This entry was posted in EIA, Government, Opinion and tagged EIA, electricity, GIBB, growth, nuclear, nuclear-1, peak demand, predicted. Bookmark the permalink. I cannot get ‘latest combined main report’ page 2 to display via this option and the ‘Read more of this post’ option does not clearly indicate what you refer to. That link to the combined main report is not easy to follow, its true. Its the GIBB web page, and you need to scroll down to the box Nuclear-1 Revised Draft Environmental Impact Report Version 2 (just below NOTIFICATION OF CHANGE OF EAP), and then open the folder Main Report. ‘Read more’ usually means ‘display the rest of this post’. Let me know if its not clear, or if I can send you the Main report PDF file. One can only wonder how much a positive report is worth to Zuma and his Russian buddies.